All dogs like to play and they need toys and playtime to occupy them from chewing other things they shouldn’t. Small dogs need small toys. Why? Well if you give a small dog a toy made for a German Shepard they may not even be able to lift it. Toys are made in different sizes for different reasons. 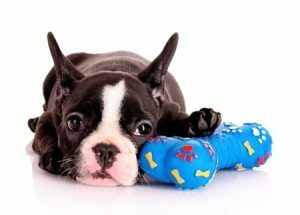 Follow our guidelines to choose the proper toys for your small pup. Right size- as we said before make sure you are choosing the correct size for your small dog. Choose toys that are small enough for them to chew and play with but not too small to where they might possibly swallow the toy. If they are able to swallow it you may have some expensive vet bills in your future. No small parts- it is not simply enough to make sure they cannot swallow the toy whole but you also have to make sure there are no detachable parts. The cute cuddly teddy bear you gave him also has very dangerous detachable eyes. If your dog doesn’t choke on them right away then they may get stuck in their intestines and that would be one of those expensive vet visits we are talking about! Indestructible squeaky toys- Most dogs like squeaky toys because they like to try and get the squeaker out of it. Squeakers are usually very small and can be another choking hazard. This means you need to find a squeaker toy that your pup won’t be able to eat through to ensure their safety from choking hazards.